The stepper is an interesting piece of equipment. It takes up very little square footage and is available in portable versions. 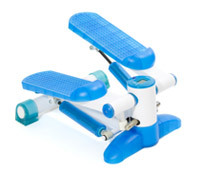 The stepper is composed of two foot plates which operate on a resistance meter. Contrary to most equipment, the more resistance on a stepper equates out to an easier workout. The amount of resistance in place keeps the steps from falling. The force (aside from gravity) on the stepper is one's own body weight. With gravity and body weight pulling and pushing down on the stepper, the feet are lifted in an alternating fashion (similar to walking up a flight of stairs) to keep the foot plates from hitting the ground. The less resistance on the foot plates, the quicker this task must be performed. These quick, consecutive movements fire the calves off creating a nice burn. Pumping of the arms also aids in elevating the heart rate. Since body weight and gravity are the forces pushing/pulling down on the pedals, one does not have to worry about getting bulky calves from utilizing this piece of equipment. The result of this machine will be toned calves, burned calories, and a stronger heart. Employing a variation called "Short Stepping" involves targeting the lower aspect of the calves to a great degree. This is performed by taking very quick steps instead of allowing the calves to rest as the plates fall towards the floor. By not achieving a full range of motion, this variation does not allow for rest to the lower calves and keep them firing constantly. The downside to this variation is that the upper portion of the calves in not targeted.